Millennial Men emerged as a new key influencer, upending the traditional dominance of women in that role. With unique data and insights on social media listening and face-to-face consumer conversations, our special report examines this significant shift in social influence dominance - one that is ripe for marketers to capitalize on. 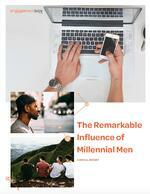 Millennial Men represent a large, informed, and connected group, with robust influencer networks – both in social media and in real life. Young Men Are Today's Influencers. Learn More About What That Means For Brands. Discover the brands and categories young men talk about the most. SPOILER: It’s not just tech and video games: They dominate beauty and personal care, too. Make Millennial Men your key to improved social influence success, both in social media and in real life.